There are so many reasons why you should visit Edinburgh, especially in August. Firstly, Edinburgh is a stunning city. It’s built on seven hills, near lots of water, and has steep craggy cliffs and cobblestoned streets, so geographically, it’s beautiful. It also has a long and fascinating history and contains some of the spookiest architecture you’ve ever seen, so it’s worth seeing at any time of the year. It’s known for being cold, wet, windy and having porridge-skies, so summer is a better time to go, but it’s also like that in summer so be prepared. Then, in August, its population doubles. For almost a month, the fringe festival takes place, with thousands of short acts featuring music, comedy, cabaret, theatre and lots more, all in a small (very hilly) area so you can get around easily and as they’re all quite cheap to see, the hardest decision you have to make is what to see and when. There’s an app to help – finding good Internet access though, well, that’s a different story. You can fits lots of shows in to a day and then there’s all the other stuff to see, like museums, graveyards, bars with over 200 whiskies on the menu (over 18s only, of course) and the nature and blusteriness on the outskirts of the city, not to mention the rest of beautiful Scotland. 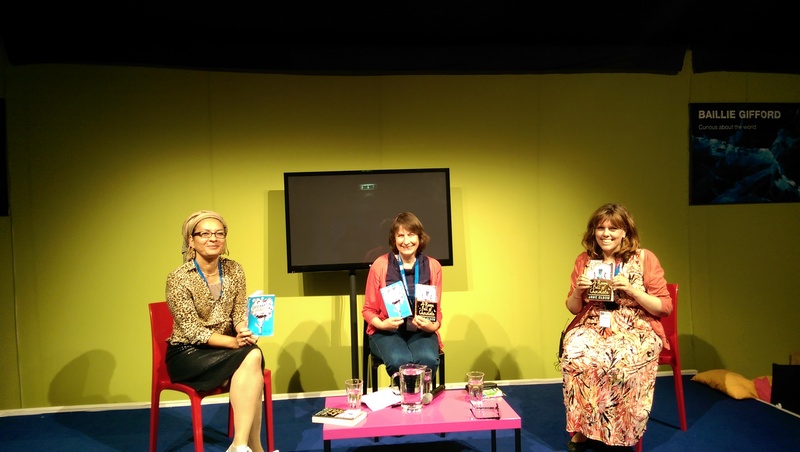 Then there’s the Edinburgh International Book Festival, which is great. It was my first time appearing at the Book Fest and I loved it. My event was with Jane Elson, who wrote ‘A Room Full of Chocolate’. We spoke for an hour about our books and did short readings, in a small tent with the rain lashing on the roof. Some lovely children and adults came to see and hear us talking about our books and some of their similar themes, and they asked us very good questions. Here we are, holding our books. We signed books afterwards and got to meet some lovely readers and budding writers. It was utterly amazing and I had so much fun, I hope to go to Edinburgh again for a whole week next year. If you’re around, or even if you aren’t but like the sound of it, come along. It’s fantastic. But there are no guarantees the sun will shine. Bring a warm jacket, comfortable shoes and a strong umbrella. It’s summer in the UK after all.